OPELOUSAS — They may have played for him in separate sports and different generations, but the men that Mel Didier once called “his boys” all drew similar conclusions. Few individuals, according to his former players, have impacted their lives more. Didier, former major league instructor, scout, and head football coach at Opelousas High and baseball coach at then-University of Southwestern Louisiana, was honored posthumously Saturday at a testimonial gathering attended by about 25 of his ex-players. Several played 1950’s football for Didier, who coached the only Opelousas High team to reach a state championship game. Others had more recent experiences that occurred when Didier coached USL baseball (1981-82) and the served briefly as the school’s athletic director. 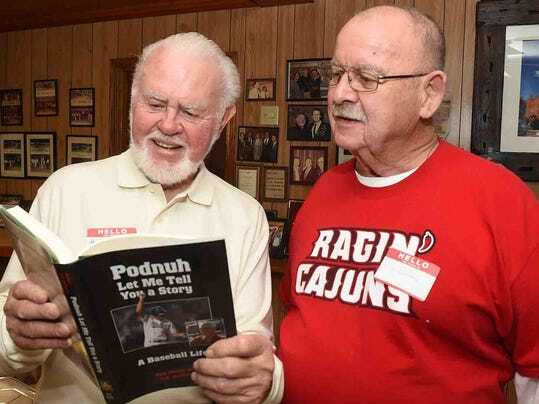 What brought them together on a cool sun-swept afternoon at the home of Opelousas businessman Bobby Dupre was the fabric of Didier’s character and influence long after they moved on into their personal lives.. The event organized by Walter Guillory, one of Didier’s former USL outfielders, featured personal memories in addition to a video of former major league players about their professional baseball associations with Didier. Didier, who died in Arizona on Sept. 25 at 91, had a special way of relating to players and teaching the games that he loved best, said former USL player Robert Dunphy. “I know he impacted my life more than anyone else in baseball and teaching me most of life’s lessons,” Dunphy said. Melvin Didier Jr., who attended the event, said the greatest thing about being the son of a coaching legend was experiencing firsthand all the anecdotes and stories that he has heard from others. “He always has a clear voice in my head. It was always no excuses and do what’s right. He had that stern hand with a velvet touch,” said Didier after receiving a state governor’s proclamation honoring his father’s life. Didier Sr.’s former players at OHS gathered in small groups outside to tell stories of difficult football practices where they tackled for three days before a Friday night game. It was always “take another lap,” if Didier thought you were tired during the three-hour practice sessions, they said. “He was definitely a taskmaster who knew the game. His idol was Bear Bryant, and he went over there to Texas (A&M) and watched their practices. “Mel was hard-nosed in the days where it was just block-and-tackle football, where you might see one jump pass a game,” said Joe Fred Godchaux, who played for Didier in 1958-59. Paul David, a running back, played for Didier, who ran the T-formation, with three backs lined up behind a quarterback. “We had linemen who weighed 125, 135 pounds, like Howard Thibodeaux and Lefty Vallien. Mel just had a way of not letting us know that,” David said. Former Opelousas Police Chief Perry Gallow played for Didier at USL (1982-83). Gallow recalled primarily Didier’s excellent communication skills. “He could do that with anyone. He had that gift. Even years later when he saw me, he still recognized me,” Gallow said. Mark Lalande, who played baseball for Didier at USL, said Didier never forgot his former players. Lalande remembered a phone message he received from Didier on Jan. 1, 2016. “This was 35 years later after I played for him and he’s calling me to wish me and my family a Happy New Year. Once you knew him, there was never a disconnect. “He was a great coach, but an ever better person,” said Lalande. Click here for the 1981 Baseball Photo Gallery. Click here for Mel Didier's Athletic Network Profile.